LOCATION.--Lat 42°20'17", long 74°27'06" referenced to North American Datum of 1983, Delaware County, NY, Hydrologic Unit 02020005, on right bank 50 ft upstream from bridge on Intake Road, about 100 ft upstream from mouth, and 0.15 mi northeast of State Highway 23, near Prattsville. GAGE.--Water-stage recorder and crest-stage gage. Datum of gage is 1,157.06 ft above NGVD of 1929. REMARKS.--Extreme low flows may be affected by discharges from New York City Grand Gorge Wastewater Treatment Plant 2 mi upstream. 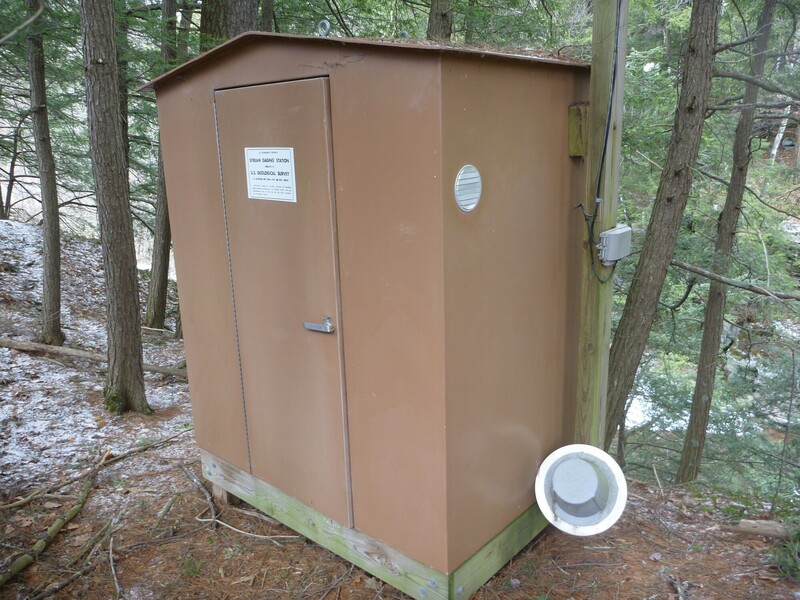 EXTREMES FOR PERIOD OF RECORD.--Maximum discharge, 2,750 ft³/s, June 25, 2014, gage height, 8.28 ft, outside gage height was 8.69 ft, from crest-stage gage; minimum discharge, 0.03 ft³/s, Sept. 10, 2001, gage height, 1.33 ft.